The V-2 missiles were launched from scattered sites to avoid Allied air attacks. The V-2 launch group had to be highly mobile and capable of off-road movement. The specialized support vehicles and efficient supply methods of the V-2 contributed greatly to the successful operational record compiled by German rocket troops. The firing of up to 8-12 missiles per day by some batteries showed the ruggedness and ingenuity of these vehicles. Some vehicles were adapted from existing Wehrmacht equipment and proved quite compatible. The V-2 rockets used a multi-component fuel. The main engine worked on a mixture of A-Stoff (liquid oxygen), and B-Stoff (75% Alcohol). To feed the rocket engine with the fuel, a 580 horsepower turbo-pump was used, wich utilized its own two-component fuel - the Z-Stoff (a mixture of sodium permanganate with water) and T-Stoff (a highly-volatil 85% hydrogen peroxide). 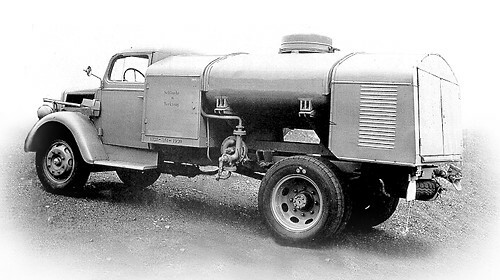 This Tankwagen carried 640 gallons of T-Stoff in aluminum containers. This mixture was highly corrosive, and could only be transported in aluminum. The vehicle was equipped with a pump in the rear with a 66-gallon per minute capacity. There was also a hand pump, with a 21-gpm capacity. Fully loaded, this vehicle weighed 13,000 pounds. It took approximately one and a half trucks to fully fuel a rocket. Not only the V-2 rockets utilized the T-Stoff, but so did the innovative rocket-powered interceptors, like Me-163 and Ba-349. They used a two-component mixture of T-Stoff and C-Stoff (Methanol). So the T-Stoff Tankers were also used by Luftwaffe. 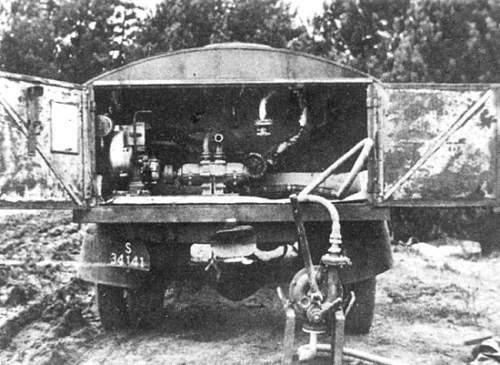 Opened rear compartment with motorized pump inside, and hand pump in front. This Tankwagen is towing Me-262-A2a/U2 - rare bomber variant with glazed nose. 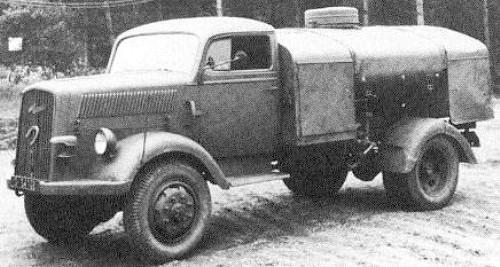 A Tankwagen on a 4x4 full drive Opel-Blitz 3000A chassis.